INDEPENDENCE, Mo. — What do Dr. Jane Goodall, Dr. Jean Vanier, Mahatma Gandhi’s granddaughter Ela Gandhi and Sister Andrea Kantner, of the Sisters of St. Francis of the Holy Eucharist here, have in common? Truthfully, many things — service, advocacy and education, to name a few. 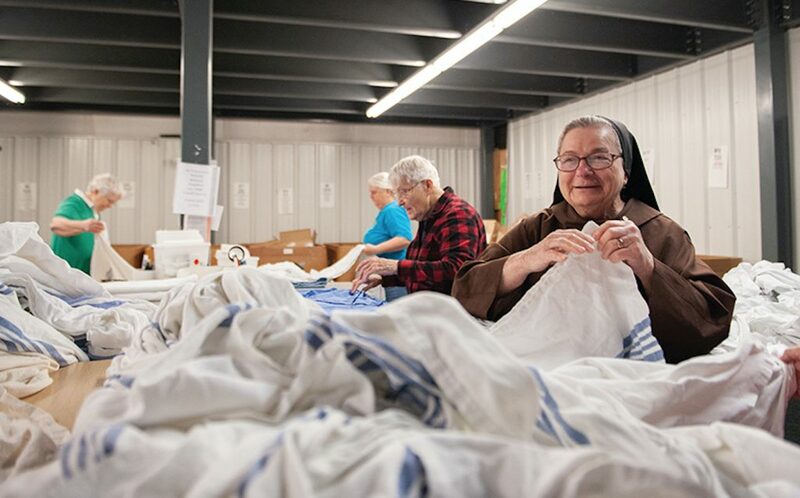 But more specifically, on April 6, Sister Andrea will join the others as a recipient of the Community of Christ’s (CC) prestigious International Peace Award (IPA) for her work at the Franciscan Mission Warehouse (FMW) in Independence, Missouri. She will be sharing the stage with representatives of Water.org, a not-for-profit founded by none other than actor Matt Damon and Gary White. Sister Andrea’s journey started in the late 1970s, when then-Pope John Paul II issued a plea for all religious communities to send a percentage of their communities to developing nations as missionaries. The Franciscan Sisters chose a rural diocese in Brazil for their mission — one in which there were 10,000 people per priest. And it was indeed rural. Their mission site, St. Joseph Parish, was located in the town of Rodrigues Alves in the Acre province of Brazil. It had no running water, no electricity and one had to travel hours by canoe or on foot to get to the nearest town. As things turned out, she spent more than 17 years in Brazil, said Sister Andrea, and she expected to live the rest of her days there. Sister Andrea’s route back to Independence was a strange one. It involved her contracting hepatitis A and B in 1991, a visit to Medjugorje in Bosnia and Herzegovina, a trip home in 1993 and finally a return to Independence for good in 1995. Meanwhile, the mission in Brazil had passed into the care of the Dominicans. But the Franciscan Sisters remained financially responsible for the mission and began receiving requests from the Brazilians for — of all things — Pepto-Bismol. And that sparked an idea. “Our plan was to send one 20-foot container of supplies back [to Brazil] so the Sisters would be able to continue giving supplies to the poor,” said Sister Andrea. That first container was sent in December 1995. And just like that, what began as sporadic shipments of Pepto-Bismol became an internationally recognized ministry: the Franciscan Mission Warehouse. With one full-time employee and a fluctuating number of volunteers, Sister Andrea began making regular shipments to Brazil. Supplies for the shipments were gathered from local hospitals, schools, organizations and hotels. These items have ranged from school desks and hospital beds to medicine and examination tables — and some special shipments have even included fire trucks. “All of the stuff that comes from hospitals would have ended up in a landfill if it wasn’t repurposed or taken here,” said Kristin Robinson, a parishioner of St. Michael the Archangel Parish, Leawood, and communications consultant for FMW. “This is recycling on a life-saving level,” added Paul Wilson, director of warehouse operations. Incidentally, in 2000, it was decided that this Franciscan mission needed a warehouse. “I was tired of rolling barrels up the hill from all of the buildings’ basements and trying to get them into the city!” laughed Sister Andrea. Even though the need for the warehouse was clear, building it was a risk. What happens if there’s nowhere to send the container? Or if, all of a sudden, supplies don’t come? The warehouse, in the end, was built using an intuitive design that could double as a retreat center. The FMW hit its first major roadblock shortly after the warehouse’s completion. Customs regulations in Brazil changed, making it impossible for a time for the mission there to receive shipments. But soon enough, aid requests started pouring in, many in relation to the 2001 earthquake in El Salvador. These days, both domestic and international requests for supplies flood in to FMW. In the past six weeks alone, FMW has shipped three 40-foot containers filled with life-saving medical supplies. And to date, FMW has shipped nearly 3,000 tons of medical supplies valued at over $33 million to over 31 countries — exclusively via donations, volunteers and one full-time employee. For many at FMW, connections with others have proved to be one of the most surprising and rewarding aspects of the work — especially for Sister Andrea and Wilson. “We’re like a real brother and sister,” he said. Wilson has been working at FMW since 2010 and, though he and Sister Andrea don’t always agree, they’ve come to verify value in difference. Wilson admits that working at the FMW over the years has helped him grow as a person. “I’ve become a kinder, gentler person,” he said. “My background is military. I’ve had to learn to not be authoritarian but to try to encourage cooperation in a gentle way. Reflecting on what FMW has meant to her, Sister Andrea couldn’t help but speak of the volunteers and her community of 12 Sisters. “The volunteers are the ones who have kept this running,” she said. “Without [them], this operation would have folded years ago. Though FMW impacts others from afar, it has never ceased to be personal for Sister Andrea. “It has increased my faith and trust in God because it was not my plan to do this,” she said. “I thought of just doing one [shipment]. With the exception of her local Rotary Club, which nominated Sister Andrea to receive the International Peace Award, and occasional story requests from the press, FMW has gone largely unnoticed in the Greater Kansas City area. “We are more known around the world than we are in our own metro area,” said Sister Andrea. But now, this quiet ministry and its founder will step into a well-deserved spotlight, thanks to the award. “[The award] gives me the chance to let other people know how big our God is [and] what he can do when you connect with people,” said Sister Andrea. FMW has also recently partnered with Project C.U.R.E., an international medical nonprofit based in Denver, which will lend much-needed shipment and supply collection support. In addition to receiving the award itself, Sister Andrea will also receive a monetary grant to be donated to a charity of her choice. The exact sum has not been released, but it is estimated to be between $20,000 and $30,000. And she knows exactly where it’s going.